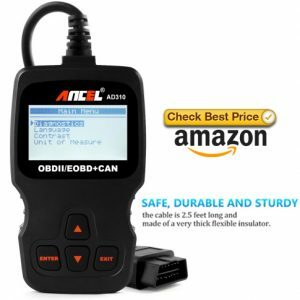 ANCEL AD210 OBD II Car Code Reader Automotive Vehicle OBD2 Scanner Diagnostic Scan Tool.Ancel AD210 code reader is well built with a high brightness LCD display (128 x 32 pixel) that has white backlight and contrast adjustment, indicates test results. Question 1:Is an Android smartphone required or does this unit display codes & descriptions itself? Answer 2:Hi, the major function of this scanner is detecting the Engine System, read and clear the error codes. It should work on your car’s engine. Question 3:Is it Mercedes compatible? Answer 3:Thanks for the question, hopefully this helps.However I must preface this answer by saying that without knowing the year / model of your Mercedes-Benz (at least, if it is possibly older than 1996) I can’t give a complete answer, but at least one bast on general automotive information. I can tell you that since the OBD system is nearly universal used for auto maintenance, it really comes down to: 1) as stated previously, as long as your car is newer than 1996 it uses the OBDII system and 2) how thoroughly you want the scanner to perform tasks. In the case of Mercedes-Benz, I know some codes and diagnostics are only available with specialized equipment at service centers (got to keep the mechanics employed!) but for many general trouble and diagnostic codes, these scanners do save time and money if you are a D.I.Y., mechanically (or can at least follow directions mechanically) inclined individual. Question 4:Will this product work on a 2012 Dodge Ram 3500 pickup? Answer 4:Hi, it should work. We can not 100% guarantee because there may be individual special models may not support. But you do not need to have any concerns,we provide 100% customer satisfaction guarantee,we will provide return and refund if it is not compatible. Question 5:Is there any way that I could recover an erased code? Answer 5:Hi, it can not recover an erased code. But our AD310 can stored codes. Question 6:If i buy 2 more of these do they each get seperate warranty? Answer 6:If they didn’t each have a warranty I wouldn’t buy them. The answer is yes I’m sure. Answer 7:I’m not totally sure but if you look under the dash board where the unit plugs into, just Mach up the plug…it’s universal but it depends on the year the car was manufactured. Question 8:Will this turn off the tire pressure monitoring system? Answer 8:I’m not sure. I put hi-flo cats on my car, and it cleared the check engine light for only a few days before it came back on again. I used it about twice a week to clear the system and kill the light but it just keeps coming back on. So even if it kills your tpms light, I think once the computer cycles through everything again, it’ll just come back on. Question 9:It says it clears error codes and turns off ck eng light. But elsewhere says it does not clear fault codes. Is there a diff in fault vs error codes? Answer 10:I used it on 08 Ford and other vehicles and it worked great, the screen came up right away. Try it on another vehicle, that should tell you if it is the reader or your vehicle. Make sure your car battery is hooked up and charged and the terminals clean. A stone dead battery could be a possible problem. Question 11:I have a 2012 mustang gt, pcm is bad, i have a new one, i am told that it needs to be re-flashed to the vehicle, can this scanner do this? Question 12:Does this read more than check engine codes? For instance, will it tell me diagnostics for the Brake and ABS lights as well? Answer 12:In searching through the many codes found in the booklet that came with my code reader, I could find nothing about the brake lights or ABS system. Question 13:will this work on my 2000 ford Taurus se? Answer 13:It is supposed to work on Ford products, but I do not have a Ford. I do know it will not work an a chrysler PT cruiser because they have the codes built into the car computer that you get with the car key. Question 14:will this work for 2005 Mazda Tribute s V6? Question 15:Difference between this and the AD310? Question 16:I have 2000 suzuki vitara jxl and a 2000 suzuki grand vitara, will this scanner work on both my veh? i see plug, not sure manufactures spec. Answer 16:Hi, it should work. We can not 100% guarantee because there may be individual special models may not support. But you do not need to have any concerns,we provide 100% customer satisfaction guarantee,we will provide return and refund if it is not compatible. Question 17:Does this work with a 2004 Kia Sedona? Yes, this product will work with your 2004 Kia Sedona, simply make sure you plug it in correctly (easy since its specific trapezoid shape only goes one way.) and only turn your key to the “on” position, not ignition position.